It’s taken a while, but the idea of commercial marketplaces is really beginning to get some traction. Or so I would judge from the conversations with vendors I’m having. Some are genuinely interested, others pay attention strictly out of the fear that a competitor will beat them to the iTunes Store of their particular niche. Either way, the volume of interaction on the subject is on the upswing, which should be a good thing for the vendors and customers alike. Marketplaces, after all, generally mean fewer barriers to entry, which is – I’ve argued – what it’s all about. With the interest, however, have come questions. To explore some of these and more, let’s do a brief Q&A. Q: Before we begin, anything to disclose? A: In discussions of marketplaces, we count as client many potential and current players, including Adobe, IBM, Microsoft and Sun. Players like Apple, Cisco and Google, meanwhile, are not currently RedMonk clients. Q: Ok. To you, what is the single most important purpose of a marketplace? A: Reducing the friction of acquisition and purchase. Consider the canonical example in this category, the iPhone. Of the millions of users of that device, what percentage would be motivated to search the web for a particular application, decipher the search results, pick from multiple options and then download and install an application for their phone – even assuming they could get over the trust factor. The percentage, I’d argue, would be exceedingly low. Present them, on the other hand, with a marketplace that makes the wealth of applications reasonably navigable and gives them an integrated payment experience, and you’ve dramatically expanded your addressable market. That’s good for consumers – applications are the lifeblood of the experience, in my view – but it’s equally good for developers, who have a simplied route to market and a commensurately expanded revenue opportunity. So while marketplaces may serve many purposes, the foremost concern in my mind should be simplifying the friction, or, as we would put it, reducing the barriers to entry. Q: What are the prerequisites for having a good marketplace? A: Volume, both in terms of audience and application volume. Volume is, of course, relative. The marketplace for enterprise application servers, for example, is likely to look a bit different than that for, say, mobile first person shooters. But obviously it is important for customers to have a reason to visit a given marketplace, and conversely for developers to design for one. Meaning that, in many if not most cases, a sizable and healthy product ecosystem will necessarily precede a commercial marketplace. Q: Who’s currently fostering commercial application marketplaces? A: There are many vendors with some of the pieces in place. Amazon, for example, has application catalogs and established support relationships with vendors from IBM to Red Hat. And speaking of IBM, the Smart Cube appliance – based on technology from the Nittix acquisition – and its application catalog – are very close to the kind of commercial marketplace I’m envisioning. Cisco, meanwhile, was so intent on creating application volume for its AXP platform that it was offering $100,000 in prize money for would-be platform developers. Microsoft, for its part, has many similar pieces in place with its Web Platform. Q: And what’s an example of a vendor or product you think could benefit from a marketplace? A: Well, apart from Microsoft’s Windows, which could be the largest and most lucrative marketplace in the world, one easy for me is Adobe AIR. Q: But Adobe has a marketplace available here, and the Adobe team discusses the launch of the update here. A: Indeed they do. But it’s got several problems that preclude it, in my opinion, from consideration. Among them, there’s the fact that they don’t support commercial transactions inline. Second, it’s not integrated at all into the client. Third, it’s not terribly discoverable: given that you own adobemarketplace.com, Adobe, wouldn’t it make sense to redirect it to the marketplace, instead of adobe.com? And so on. But to the previous question: AIR’s an interesting platform with some interesting clients. A wider, richer commercial ecosystem could benefit both the platform and Adobe, particularly from a revenue perspective. Q: Speaking of the revenue picture, what’s fair in terms of the percentage of sale taken by the marketplace provider? A: Fair rarely enters into it; the economics of the marketplace are generally determined by the strength (or desperation) of the marketplace provider. Those in monopoly or near monopoly positions command substantial cuts ranging from 25% to 50% – 30% in Apple’s case, for example – while those not in similar positions, or those that are open source based may not charge at all. Q: What’s the thing that you think that developers of marketplaces are still missing? 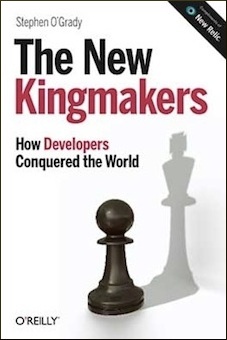 A: The incorporation of developers. Yes, those that develop applications are being given a market for their wares: that’s excellent news, and progress. But what about the after market of installation, configuration, tuning, modification, maintenance and so on? As I’ve written before, I remain baffled that businesses are forced to conduct often expensive searches for qualified consultants on projects or resort to distinct and siloed resource databases like Monster when a marketplace could connect them to qualified, rated resources far more efficiently. Still, baffled or no, somebody’s going to do this right and they’re going to be either rich or massively popular; maybe even both. Re developers, you are spot on. I remain amazed that cellphone companies don’t actively woo open-source developers by providing an open-source friendly platform.